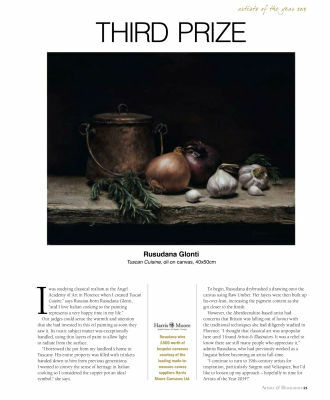 Fine Art by Rusudana Glonti: 3rd Prize at the Artist of the Year 2013 Award! More great news! Artists & Illustrators magazine has awarded me 3rd prize at the Artist of the Year 2013. "I was studying classical realism at the Angel Academy of Art in Florence when I created Tuscan Cuisine", says Russian-born Rusudana Glonti, "and I love Italian cooking so the painting represents a very happy time in my life." Our judges could sense the warmth and attention that she had invested in this oil painting as soon as they saw it. Its rustic subject matter was exceptionally handled, using thin layers of paint to allow light to radiate from the surface. "I borrowed the pot from my landlord's home in Tuscany. His entire property was filled with trinkets handed down to him from previous generations. I wanted to convey the sense of heritage in Italian cooking so I considered the copper pot an ideal symbol", she says. To begin, Rusudana drybrushed a drawing onto the canvas using Raw Umber. Her layers were then built up fat-over-lean, increasing the pigment content as she got closer to the finish. However, the Aberdeenshire-based artist had concerns that Britain was falling out of favour with the traditional techniques she had diligently studied in Florence. "I thought that classical art was unpopular here until I found Artists & Illustrators. It was a relief to know there are still many people who appreciate it", admits Rusudana, who had previously worked as a linguist before becoming an artist full-time. "I continue to turn to 19th-century artists for inspiration, particularly Sargent and Velasquez, but I'd like to loosen up my approach - hopefully in time for Artist of the Year 2014!"